What do SCOTT TRAVIS, JOHN BONHAM, TOMMY LEE, NEIL PEART, ALEX VAN HALEN, BILL WARD, and DAVE LOMBARDO have in common? 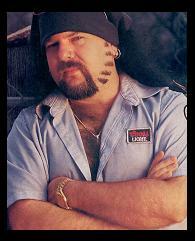 They are all considered the best hard rock/metal drummers of all time, just like VINNIE PAUL. No other drummer is history can can go from playing ballads to break neck blast beats like VINNIE PAUL. Songs like 13 STEPS TO NOWHERE, REGULAR PEOPLE, USE MY THIRD ARM, YOU'VE GOT TO BELONG TO IT, BECOMING, and I'LL CAST A SHADOW are proof that VINNIE is the most talented metal drummer of the past, present, and future. While other drummers are either good at playing double bass really fast, blast beats, country music, or some other genre of music on the drums, VINNIE can play any style. Even though VINNIE is known for his precise timing, awesome sound, and technical ability, no one has ever been as versatile behind the kit as VINNIE PAUL.